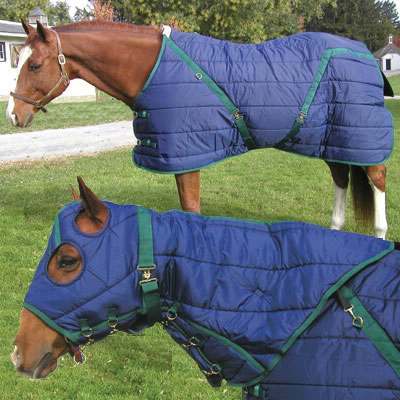 Get your High Spirit Stable Blanket Snuggie Hood and Horse Hood products today made of unmatchable craftsmanship. Your Horse deserves only the best Horse Blanket Hood. We are confident that the Horse Hoods selection we have available are sure to satisfy you. This High Spirit Stable Blanket Snuggie Hood has similar composure to the blanket & is designed to match and accompany the blanket. The hood comes with two straps to attach the hood to the blanket, with another five enclosure snaps to make sure that the hood is locked securely in place. The horse cover hood has one surcingle at the throat that is adjustable. As horse enthusiasts ourselves our number one priority is to offer our customers Horse Blanket Hoods which we believe are made to last and available at affordable prices.